Before embarking on this trip, I wasn’t sure about what we would find. The Caribbean is not a backpacker destination, so if you get away from of all-inclusive resorts and luxurious marinas, it is virtually unknown territory for travelers. Actually, I had some doubts about this trip, particularly about where we would sleep without staying at expensive hotels or whether we would find a sailboat to give us a ride. So I imagined myself camping on idyllic beaches, eating tropical fruits, visiting marinas to find a sailboat ride and dancing to the reggae music of Bob Marley. Logical thoughts that came to my mind before undertaking a trip like this. However, the good thing about traveling is no matter what you think is going to happen, in the end the path is full of amazing surprises and you never know what the future holds. What I could never have imagined is that we would live on a real pirate ship!!! Our visit to the French island of Martinique was a great experience. 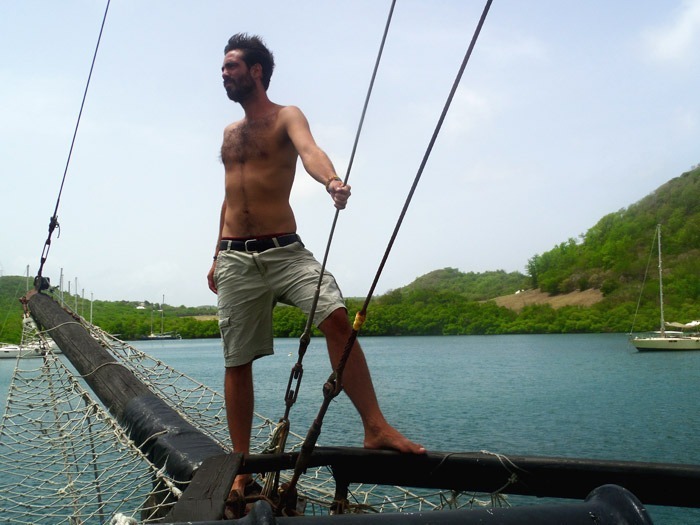 We contacted a guy through Couchsurfing and he said we could stay on his boat. We saw pictures on his profile and it seemed like a cute sailing boat. We thought it would be a different experience and decided to spend a few days with him. “Yeah, sure, no problem” – we said. Getting to know Victoria, Queen of the Seas. Finally, he brought us to the boat. There she was, impressive and majestic: a huge pirate ship named Victoria. We could not believe it! Was this our new couch? Thanks, Couchsurfing! Victoria is a replica of the legendary ship of Magellan. It was built in the Czech Republic. After sailing up the river to the Atlantic, it finally got to the Caribbean. The owner lets travelers stay on board for free in exchange for taking care of the ship, so some people have been living there for months. 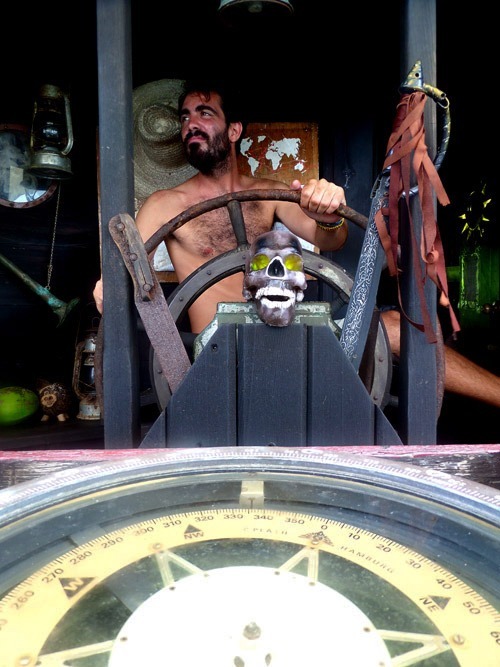 Living on a pirate ship is a very interesting experience. The cabins were really authentic, with wooden beds, standing water and some cockroaches. Fresh water was a very valuable commodity because it is collected rainwater that is stored in tanks. Most of the time we had less than one liter per person to take a shower… Can you imagine that? It can certainly be an art to soap up and rinse off with that amount. As for transport, since Victoria is anchored in a bay, we had a kayak to get to the mainland so we could go to the beach or buy some food. The place is very beautiful and it’s full of other anchored sailboats, mainly “sea-gypsies” who have decided to spend their lives at sea. Sometimes we swam to the other side of the bay to visit Karol, who lived just opposite Victoria. Then, friends from different boats would arrive to talk. It was a nice community of sea dogs and we were very happy during our a few days there! Thank you, Karol, for your time, for sharing your amazing stories and for letting us know Victoria. 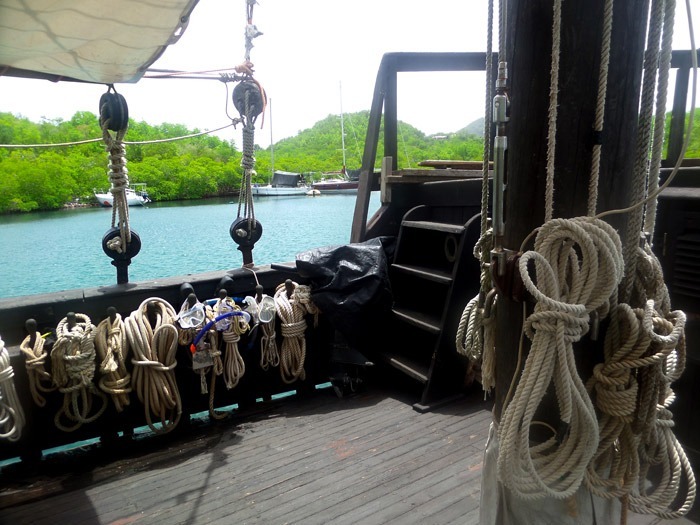 I’ll never forget that, for over a week, we lived on a pirate ship. 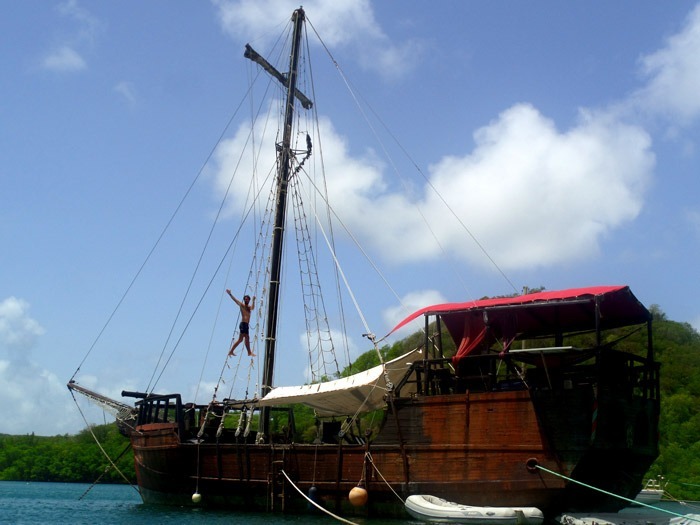 Do you have any question about That time I lived on an old pirate ship? Leave a comment!